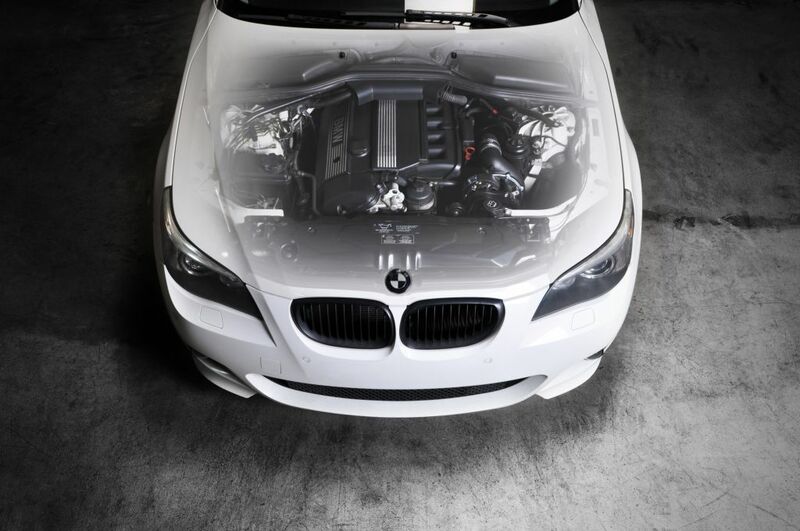 VF-Engineering chose to supercharge the BMW 5 Series to improve throttle response and mid-to-top end power with the centrifugal Vortech supercharger. With the 3.0 liter version being a bored and stroked upgrade of the 2.8 motor, both variations are otherwise virtually identical. Maintaining the the original BMW quality, smoothness, and reliability were the key factors in the VF design. This is where the VF software comes into full play. VF have harnessed reliability of Vortech superchargers and quality of VF custom software with their 19 years of supercharging experience and worldwide OEM supply contacts to create the ultimate supercharger system for the ultimate drivers car. All key components are 100% made in California. This system has been fully road tested and dyno tuned on both the Mustang MD500AWD and in-house Dynojet 224XLC dynamometers with and without engine load. All kits are setup at 6 psi and create as much, if not more power than similar products running greater levels of boost. VF engineers spent over 12 months software testing the BMW Bosch and Siemens ECUs and resolved stalling and MAF issues faced by other supercharger systems. Software flash technology and latest BMW file versions have all been employed to provide the cleanest and the most reliable method of software installation. VF engineers extensively re-wrote the ECU software using their own binary, assembly and disassembly algorithms written from scratch. Testing the software included extensive road and dyno test cycles, with acceleration and deceleration tests for driveability smoothness and ECU fuel management. All test cars were put through long term full throttle testing in conditions varying from wet cold climates to hot dry Arizona desert temperature for safe-optimal air fuel ratios and knock activity monitoring. Competently-written ECU software has allowed VF to fully explore the potential of the BMW engine, making over 40% more power in most applications. VF chose to mount the Vortech supercharger with an in-house CNC machined aluminum bracket system. The unit is positioned in line with the original serpentine belt which is replaced with a longer OEM belt. The key to this design is that the OEM active-spring belt tensioner remains fully functional and eliminates belt slip or the need to manually tension the belt. The supercharger air ducts are custom molded in-house from plastic to give an OEM appearance, quality and fit. The incorporated Bosch boost overrun system is designed for smooth off-throttle cruising and deceleration with clean emissions. The crankcase ventilation system is designed to cope with positive pressure and high flow OEM injectors are supplied to fit as direct replacements without modification to the injector rail. A removable plastic air box is provided with the K&N induction filter for those who use their vehicles in persistently wet climates.The VF supercharger system remains fully OBD2 compliant and is supported by a 1 year unlimited mileage warranty on the product only. Installation can be performed in approximately 8 hours and is non-intrusive, allowing it to be fully reversible. This product is not compliant with the California Air Resourse Board and not for use on public roads in California. This applies to any aftermarket product that does not display a CARB EO#.